1. DigitalOcean (growing)– The simple cloud hosting company went through TechStars and received seed funding in May of 2012. The company boasts on their website they have launched 550,000+ cloud servers. CEO Ben Uretsky is also the CEO of ServerStack, another New York company providing managed hosting services for enterprise clients. Digital Ocean is popular with developers and is big enough to receive DDoS attacks, often an unfortunate rite of passage for popular cloud software development tools. UPDATE: DigitalOcean closed a $3.2M Seed Round with CrunchFund, IA Ventures and TechStars in August 2013. A $37.2M Series A round in March 2014 with CrunchFund, Andreessen Horowitz and IA Ventures. They closed $50M in venture debt with Fortress Investment Group in December 2014. Their latest round of funding is a $83M Series B with Andreessen Horowitz and Access Industries. Their total amount raised is $173 million. Since June 2013, DigitalOcean has gone from 13 employees to 174, last month. They’ve gone from just over 360,000 page views in June 2013 to 2,612,000 page views in November 2015. 2. Moveline (zombie?) – Provides decision-making tools for people about to embark on a long-distance move. The company has raised $1.75M in seed funding to date, most recently taking $1.5M in October 2012 from several angel investors including Lowercase Capital, 500 Startups and David Cohen. They are a graduate of TechStars. UPDATE: Moveline moved from New York City to Las Vegas in April 2014 when they closed a $3M Series A round with ff Venture Capital. Based on our data and looking at their social profiles, it appears that Moveline shutdown (or became a zombie) around December 2014. 3. Poptip (acquired) – Provides a realtime social feedback channel for brands, celebrities and other “cool people” to ask questions of their followers and crowdsource answers. The company is a graduate of Techstars (I’m starting to notice a pattern here) and raised just over $1M in seed funding in June 2012. UPDATE: Poptip was acquired by Palantir Technologies on July 29th, 2014. No exit amount was disclosed. 4. Custora (growing) – is a predictive marketing platform built for e-commerce teams. Our software helps retailers acquire valuable customers and improve customer retention. They are used by well-known online shopping companies like Crocs, Guess, Bonobos and Etsy. The company was part of the Y Combinator Winter 2011 batch and raised a $850K seed round in January 2012. UPDATE: In April 2015, Custora closed a $6.5M Series A round with Greycroft Partners, Foundation Capital, Valhalla Partners. They have gone from 8 employees in September 2013 to 32 last month. 5. Bespoke Post (staying steady) – The subscription box service for men sells its “Box of Awesome” to upgrade the lifestyles of guys everywhere. They are working on changing how guys discover and buy unique goods with themed boxes, compelling storefronts, and click-worthy content. 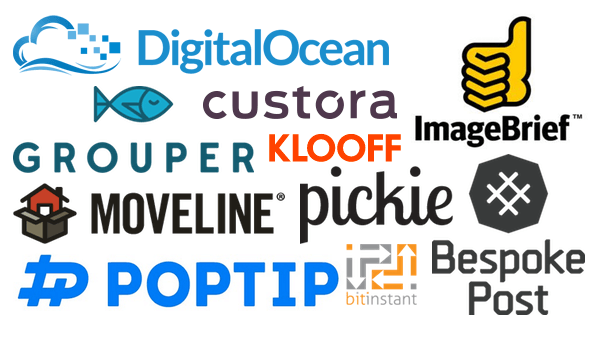 Bespoke Post raised $850K in seed funding from Great Oaks, 500 Startups, and BHV in March 2013. UPDATE: Bespoke Post has not raised a Series A. They have doubled their employee count from 12 to 25 employees in 2 years and have consistent web traffic with an average of ~541,000 page views each month for the last year. 6. Pickie (acquired) – Pickie is creating a catalogue shopping experience designed for mobile and tablet users, personalized daily to each users tastes and preferences. They’ve been partnering with influential fashion bloggers / stylists / buyers like Cara McLeay to create unique “spreads” reminiscent of a woman’s fashion magazine. The company graduated from TechStars in March 2012, and raised $1M in seed funding in October 2012 from a slew of angels including Betaworks, DFJ Gotham, MESA+ and others. UPDATE: Pickie did not go on to raise another round of funding and was acquired by RetailMeNot on April 15th, 2014. Here’s their announcement. 7. Grouper (zombie?) – Our co-founder Andy has used the service 6 times so far ($20 each time) and he says, “It’s an awesome low pressure way to meet people in a big city when you’re single, it’s great to just have drinks and not know what’s expected to happen… you could go home with any of these 3 girls, or none of them. It’s also a great way to discover cool new bars, and worst case scenario is you’re drinking with the guys you came with.” In fact, he loves it so much he’s going on one on his birthday! They raised seed funding from SV Angel in May 2012. UPDATE: Grouper has not publicly raised funding since 2012. Based on Grouper’s Growth and Mindshare Scores, as well as social media presence and these tech media posts, it seems Grouper may be alive, but barely. 8. BitInstant (shutdown) – A payment processor for Bitcoin exchanges and other merchants, they raised $1.5M in seed funding from the Winklevoss brothers in May of this year and have been taking advantage of BTC prominence in the media by launching a new beta website. UPDATE: (from Wikipedia) Founded in 2011 by Gareth Nelson and Charlie Shrem, BitInstant provided a means to rapidly pay traditional funds to bitcoin exchanges. As of January 2014, BitInstant’s website is no longer available, displaying only a blank page. Its blog, was unavailable as of October 31, 2014. 9. Klooff (pivot) – Every editorial bone in my body is telling me not to put this in the list, because the site is so bare bones and the idea seems silly… it’s basically Hot or Not for animal pictures, but after using it and giggling for a few minutes my personal happiness is definitely increased. I figure you could use a little joy in your Series A company search, too. These guys are legitimately growing too,gaining more than 400,000 new Facebook likes just in the past week, which is pretty damn hard to do. They were in the most recent TechStars NYC batch. UPDATE: Klooff has not raised another round of funding and appears to be moving from their mobile app to being a Facebook Page community on 11/30/15. 10. ImageBrief (growing) – Odds are you’ve searched for stock photos before, and ImageBrief is a marketplace where photographers sell their images directly to people looking to use them on websites, in blog posts, news stories and other digital media. It’s an alternative to Getty / iStockphoto. The company took $700K from angel investors in March 2013 and an additional $750K with Great Oaks Venture Capital in June 2014. UPDATE: ImageBrief raised an additional $750K with Great Oaks Venture Capital in June 2014.